As austerity falls like a winter blizzard across the nation, Claudia and Leonardo Peruzzi are feeling the pinch. The young couple are something of a novelty in Italy, not simply because they have three children when the norm is to stop at one. The Peruzzis actually pay tax, and a fair whack at that. They work for foreign multi-nationals so their taxes are directly deducted. Not far from the Peruzzis, effervescent barista and café owner Francesco plays the tax regime a little more, well, Italian. Both Francesco and the Peruzzi’s live and work in a city dominated by the architecture, iconography and sheer presence of the Catholic Church and as they struggle to pay their bills and get by, they’ve grown increasingly uncomfortable about the tax breaks and special privileges enjoyed by the Church. LEONARDO: If you look out of the window two kilometres from here there is St Peter’s Cathedral, so we feel the power. I think everybody small or big must make a sacrifice. CLAUDIA: If it is a sacrifice for everyone it is good. If it is only for few people it’s not good. Direct from a jaunt through the prosperity and optimism of Germany’s booming Bavarian region (A Bavarian Fairytale FC Feb 14) Foreign Correspondent’s Eric Campbell fires up the gothic candle, lifts the heavy latch and heads into the labyrinth of the Church’s coffers to examine if it has been playing things by the Book. Along the way he discovers evidence that all’s not above board and meets critics who say so, particularly when it comes to the Church’s extensive real estate holdings and hotel operations. ‘The councils that could collect (property) tax estimate they’re losing 400m to 700m Euros every year. Another estimate from a research company which investigates tax evasion is 2.2 billion Euros every year.’ STEFANO LIVADIOTTI, Author. And while the Government has announced the Church will be captured by changes to the tax regime it’s not exactly a red-hot agenda item at top of the to-do list. ‘The church is not the problem of Italy right now. For Italy accumulating debt or Italy not growing very fast. So ah frankly it’s not on the top of our agenda because it’s not a top problem.’ DEPUTY FINANCE MINISTER VITTORIO GRILLI. CAMPBELL: Rome – the greatest city in history for intrigues and mysteries. Forget the fictional Da Vinci code, there are real secrets here, especially in its oldest establishment, the Roman Catholic Church. Even today, few have any idea how much property the Church owns, how much money it’s making from it and whether it’s paying its fair share of tax. But before we go down that labyrinth, let’s take a look at why ordinary Romans aren’t happy with the status quo. Claudia and Leonardo Peruzzi are among those unfortunate Italians who pay full tax. Both work for foreign companies that deduct every cent due. LEONARDO PERUZZI: “Unfortunately this is not very typical in Italy at least for what we say, for what we see..... for our friendships and so on”. CLAUDIA PERUZZI: “The people who used to pay tax have also to pay more because of the people who can’t pay, who don’t pay”. LEONARDO PERUZZI: “Something like fifty-five per cent of our salary goes to taxes or something like that”. LEONARDO PERUZZI: “Really from January the first to July the fifteenth we work for the state. Very nice”. CAMPBELL: What makes them even more unusual is that they’ve had three children. These days most Italian couples stop at one. Each night is chaos as they try to bath, feed and bed their brood and inevitable sleepover friends. LEONARDO PERUZZI: “We look like people coming from Mars in Italy now”. LEONARDO PERUZZI: “I don’t know. Maybe…”. CLAUDIA PERUZZI: “Well it’s very difficult because of also..... I mean the economic situation.... it is costly because schools are very costly because I mean the life in general is expensive”. LEONARDO PERUZZI: “Is very expensive yeah. I mean the Italian situation was incredibly critical. Now is going to be a little bit better in last one/two months but looking at Greece and Portugal we must be, I mean we must check at any week, at any time the critical situation. So I think everybody small or big must make a sacrifice”. CAMPBELL: Like most of Europe, Italy is drowning in debt. The government needs to find nearly two trillion Euros to pay it off, but few Italians want to help. Tax evasion has become something of a national past time – as Italian as cappuccino. Just ask this 30-year-old café owner who we’ll call Francesco. FRANCESCO: “Many people try to evade taxes because they think they’re too high and there are too many. Sometimes you just have to try to work the system in order to get ahead”. CAMPBELL: Francesco’s technique is simple. If he thinks he can get away with it, he doesn’t record the sale. FRANCESCO: “Often when you know a client really well, you don’t print a receipt so that the transaction is not registered on your books. This way, you avoid paying tax”. CAMPBELL: Like all Italians, Francesco is worried about his future. His mother mortgaged the family home to pay for the café last year. Then the economic crisis erupted, a legacy of politicians who fiddled while Rome burned. The former Prime Minister Silvio Berlusconi, famous for surrounding himself with beautiful young women, even making them his ministers, personified the shamelessness of Italy’s political class. But these are strange days in Italy. There’s a new government in town as surprising and unfamiliar as the snow that recently blanketed Rome. Since Berlusconi was forced to resign in November, the country has been led by unelected officials, economic technocrats appointed by the President to save Italy from the economic storm and they’ve vowed to do so by ending the dirty deals and special privileges created by the politicians. The new Prime Minister is Mario Monti, an economist and former European Union bureaucrat. He’s brought in tough austerity measures including spending cuts and delayed pension payments and he’s opening up every trade and profession to the chill winds of competition. Groups in the firing line are doing everything to stop him. Truckies have blockaded Rome – even lawyers and pharmacists are threatening to strike. Today it’s taxi drivers at Circus Maximus, furious the government will free up licences. TAXI DRIVER: “We’re talking about Monti’s butchery. By Monti’s butchery we mean deregulation – only for the little people”. CAMPBELL: But the selling point for the wider public is that the sacrifice will be shared by everyone. There’ll be no more special favours and no more untouchables. The man responsible for implementing the new program is economics professor and Deputy Finance Minister Vittorio Grilli. VITTORIO GRILLI: “What you are saying that there should not be any untouchable, that the sacrifices and the change are true for all is one of the blueprint of the action of this government so of course we are very, very careful in that”. VITTORIO GRILLI: “I think that when Italian thinks of untouchables in Italy has many other things in mind well before the Church. Of course all that said, we try to be fair and careful. Everyone - profit organisation, non profit organisation - will have to contribute”. CAMPBELL: Governments have long been loath to take on an institution that pulls crowds like this. Every Sunday Catholics come from all over the nation to see their “Papa”. For centuries the Pope ruled half of what’s now Italy. 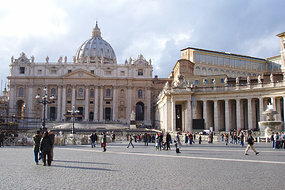 His kingdom has now shrunk to Vatican City, a small hill around St Peters Square, but the Church still owns the country’s biggest and more valuable real estate portfolio and much of it is earning vast sums for Church coffers. Look around the famous piazzas in the old city of Rome and it’s likely every second building belongs to the Church. They’re not just chapels, schools and hospitals. They include some of the finest residential compounds and guesthouses in the world. Many have been rented out as apartments, shops and restaurants or turned into hotels. MARIO STADERINI: “Now we are in Piazza Farnese – one of the most beautiful piazzas in Rome. This place was once a college or convent of the Brigidine nuns of Italy. It was, like so many other properties, converted into a guesthouse for tourists – luxury tourists too, because it’s such a good area”. MARIO STADERINI: “It seems so – or something like it, yes”. CAMPBELL: Mario Staderini was once an activist for the Church but he’s become a thorn in its side. He’s now Secretary of the Italian Radical Party which claims the Church is avoiding hundreds of millions of Euros in tax on its commercial holdings. “So the Church owns properties all over Rome, not just churches. MARIO STADERINI: “A lot of property, a lot of property”. CAMPBELL: Of particular interest are the many Church owned hotels, holiday houses and rental apartments that have sprung up around the country, even in the building where the Radical Party has its headquarters. MARIO STADERINI: “We have up and down from us two holiday houses, a religious holiday house – Suore Operaie and Suore Benedettine. I never seen nun or priests go in, but always tourists and I don’t know if they pay tax”. CAMPBELL: The reason it’s hard to know is that the Church’s tax affairs remain a tightly held secret, its property assets hidden behind hundreds of front companies. MARIO STADERINI: “Well, we’ve suggested for years that a census should be conducted of all the Church’s properties across Italy because the Vatican is the biggest property owner in all of Italy. So with a census, we and the Vatican can know for sure who evades taxes and who doesn’t. Unfortunately, not one council nor one Italian government has wanted to put itself in opposition to the Church”. CAMPBELL: Stefano Livadiotti spent 18 months trying to pierce the veil of secrecy. He’s an investigative journalist and author of a best selling book on Vatican finances. STEFANO LIVADIOTTI: “We’re not talking about small sums of money. The Church hotels, even if they are masquerading as places to host pilgrims and the faithful, have reached earnings of five billion Euros a year”. CAMPBELL: The Church has been able to avoid paying property tax though a bizarre legal loophole. It exempts commercial properties that aren’t exclusively commercial. Nobody’s quite sure what that means but it’s given huge wiggle room to Church hotels that also have chapels, no matter how small or unused. STEFANO LIVADIOTTI: “The councils that could collect this tax estimate they’re losing 400 to 700 million Euros every year. Another estimate from a research company investigating tax evasion is 2.2 billion Euros every year”. CAMPBELL: Italy’s senior priest, Cardinal Angelo Bagnaso denies the Church has been dodging tax. He heads the Italian Bishops Conference and is often tipped to be the next pope. CARDINAL ANGELO BAGNASO: “Tax evasion is a very serious thing. I would say it’s a sin, not just from the point of view of morality, but in respect of our responsibility to society”. CAMPBELL: “Some would say the Church then is a sinner for not paying enough tax”. CARDINAL ANGELO BAGNASO: “The Church pays taxes according to the general laws. If there’s a commercial activity the law states that you pay property tax. There is no problem with that”. STEFANO LIVADIOTTI: (watching Eric’s interview with the Cardinal) “As often happens the President of the Bishop’s Conference isn’t telling the truth. He says there’s no problem with paying tax when there’s a commercial activity, as the law stipulates – but there is a problem, because according to estimates of the councils 95% of the taxes that should be paid by the Church and collected by the councils, are never actually paid”. CAMPBELL: The Church has not only enjoyed generous legal tax exemptions, there are strong suspicions it may also have been breaking the law. Mario Staderini went undercover with a hidden camera to investigate. MARIO STADERINI: “For example, the “house of priests” in the centre of Milan directly behind La Scala Theatre should be reserved exclusively for the use of priests. I went to check in person. Have a look at this”. CAMPBELL: He got hold of a list of properties in Milan that were tax exempt because they only took religious visitors. But he had no trouble booking rooms as an ordinary tourist. MARIO STADERINI: “I could sleep in a simple room for fifty Euros…let’s say, like the equivalent of a 1 or 2 star Italian hotel. They accepted me even though I wasn’t a priest. NUN: “Lots of people from Australia”. MARIO STADERINI: “Well on the one hand it could have seemed like I was a little guilty but in reality I do what I am doing to liberate the Catholic Church from power and money – because too much involvement with power and money disorientates the Church and its priests and nuns and keeps them from their true calling of the evangelic message”. CAMPBELL: Private hoteliers have long been urging the government to act. CAMPBELL: Barbara Ricci’s family owns the historic Hotel Adriano in the centre of Rome. “And you’ve completely restored it and renovated it…”. BARBARA RICCI: “Yes completely renovated and the last renovation was in 2008”. CAMPBELL: “Wow so you’ve put a lot of investment into this hotel”. BARBARA RICCI: “A lot, a lot of investment”. CAMPBELL: “In a very tough market”. Her property tax bill comes to sixty thousand Euros a year and she’s angry that the many Church-run hotels around her may have been avoiding it. BARBARA RICCI: “If these religious places welcome “pilgrims” who are actually students or tourists then they are not respecting the rules and I think it’s necessary to really get it under control as soon as possible”. CAMPBELL: Her fear is that the government will just make a sweetheart deal with the Vatican. BARBARA RICCI: “We hope not, but if there is an agreement between politics and Vatican... we suffer... but we don’t know, and we want to be equal”. CAMPBELL: The fact is many Italians believe their Church is evading tax. Another reason they might as well too. FRANCESCO: “The Church should contribute and should pay just like the rest of us. I reckon the Church lives more “in the black” than the rest of the world put together”. CAMPBELL: Until recently, nobody’s looked askance at people like Francesco and there’s been little worry of being caught, but now there’s a slight nervousness when police pop in for a cuppa. The government has launched a massive crackdown, government ads labelling tax evaders parasites. GOVERNMENT ADVERT: “Lives at the expense of others – damages everything”. CAMPBELL: But for all the talk of nothing being untouchable, even this government seems uncomfortable when it comes to the Church. VITTORIO GRILLI: “But frankly, I mean I don’t see it. I mean the Church is not the problem of Italy right now so I don’t know why there’s so much interest in Australia, but frankly for us the Church is not a problem of how to transform Italy. I mean the problem of transforming Italy it goes..... you know has many dimensions and certainly, frankly I don’t think the Church has been an issue for Italy accumulating debt or Italy not growing very fast so frankly it’s not on the top of our agenda because it’s not a top problem”. CAMPBELL: Hours later, officials from the Prime Minister’s office rang us demanding to know why we asked so many questions about the Church. Then, two weeks later, under pressure from the European Union, the PM promised to close the tax loophole. Some Vatican watchers are sceptical. STEFANO LIVADIOTTI: “They can say, ‘We have done something for the country in a difficult time – we have played our part by paying’. On the government’s side it can say, ‘Finally, as a technical government, we have made the Church pay tax’. But the result will be another Italian sweet deal, as always”. CAMPBELL: “Now it’s one thing to try and get more out of the Catholic Church in Italy, quite another to try and get it out of the Vatican because while I’m now standing in Italy, if I take one step into St Peter’s Square, I’m effectively in a different country. Italy has treated the Vatican as an independent State since the 1920s when the Church made a deal with the fascist leader Mussolini. So while the headquarters are in Rome, its earnings can’t be taxed and its finances can’t be scrutinised”. Any visitor to Rome will notice fleets of these buses taking tourists on so-called pilgrimage visits. The Vatican company ORP has become one of the biggest players in the Italian tourism industry, even running discount flight packages. While it pays incidental taxes like VAT on transactions inside Italy, its profits go offshore to the Vatican where they can’t be taxed. MARIO STADERINI: “So in my view we are talking about a situation of unfair competition for normal hoteliers and tourism operators”. CAMPBELL: But the Church has been quick to point out how much it gives. As well as its pastoral role, it’s helping the government cope with the economic crisis. CARDINAL ANGELO BAGNASO: “Certainly the Church in all its activities – not forgetting its many volunteers – offers a lot of services and support to society and the State”. CAMPBELL: The Catholic charity Caritas is one of the few agencies trying to look after the growing numbers of homeless. 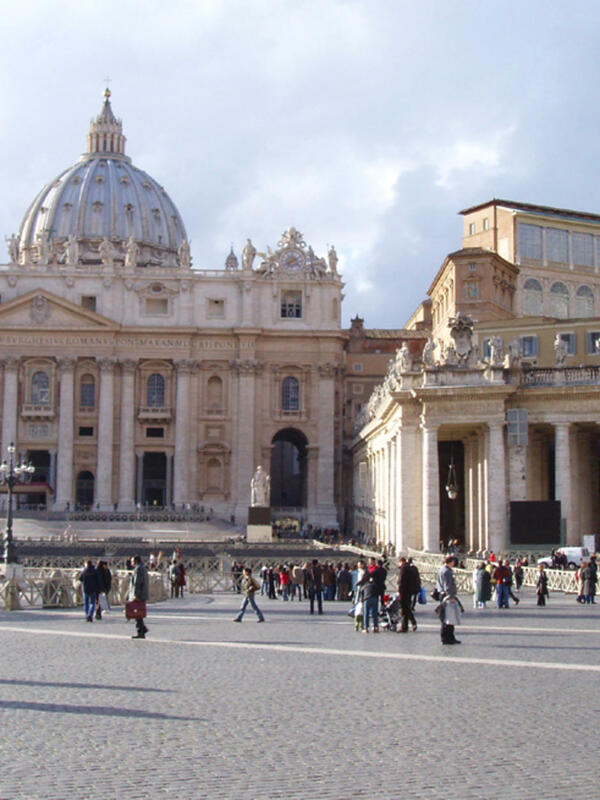 The Italian State has effectively outsourced its social welfare programs to the Church. At this centre near Rome’s main railway station, Mario Urbanati and his staff, ninety per cent of them volunteers, struggle to look after a thousand people a night. MARIO URBANATI: “For the last few years we have started to see more families…mothers with babies. And also we have noticed more elderly people – husbands and wives who come in to be fed because they have problems feeding themselves and paying the rent. They don’t have enough to live on and get ahead”. CAMPBELL: But for all the Church does for the state, it gets a lot more back. Point eight per cent of all income tax collected goes to charity and ninety per cent of that ends up in the Catholic Church. So even in the midst of this economic crisis, Italian taxpayers are still giving the Church more than a billion Euros a year, more than enough to pay the wages of every priest and Church official in the country. So much for separation of Church and State. FRANCESCO: “Nothing will ever happen with all of this because the Vatican is too powerful to take on and ask to pay taxes. The Church matters too much in Italy as it stands”. CAMPBELL: But Leonardo and Claudio Peruzzi, both practicing Catholics, are praying things will change for the sake of their country and their Church. LEONARDO PERUZZI: “If you look out of the window, two kilometres from here there is St Peters so we feel the power. I think everybody small or big must make a sacrifice”. CLAUDIO PERUZZI: “It is a sacrifice for everyone. If it is for everyone it is good. If it is only for a few people it’s not good so it seems that this type of government.... it works differently from the previous one. So we are..... fingers crossed”. CAMPBELL: Their hope is that the Church will simply follow what Jesus told his disciples under the rule of Ancient Rome – “Give Caesar what belongs to Caesar and God the things that are God’s”.